The #photooftheday is an image of a dust devil snapped by the HiRISE camera on the Mars Reconnaissance Orbiter. The camera is operated by the University of Arizona Lunar and Planetary Laboratory (LPL). tracking across the flat, dust-covered Amazonis Planitia in 2012, the core of this whirling dust devil is about 140 meters in diameter. Lofting dust into the thin martian atmosphere, its plume reaches about 20 kilometers above the surface. 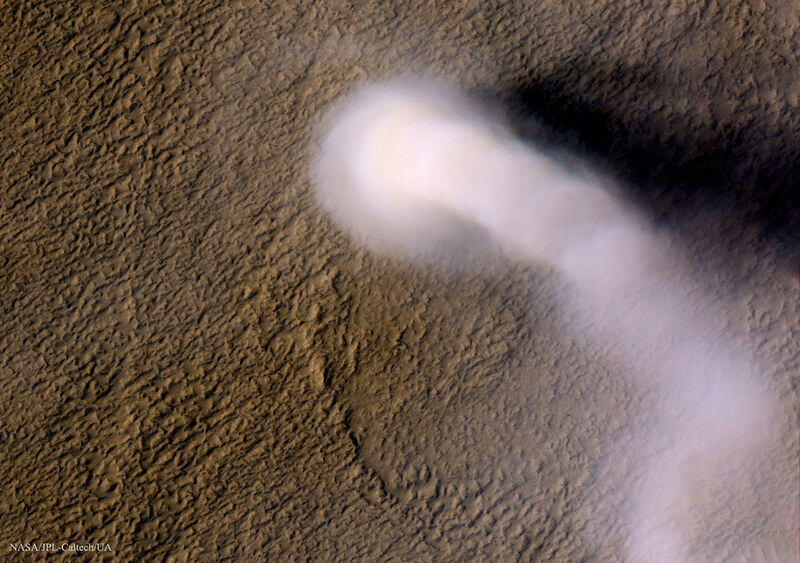 Common to this region of Mars, dust devils occur as the surface is heated by the Sun, generating warm, rising air currents that begin to rotate. Tangential wind speeds of up to 110 kilometers per hour are reported for dust devils in other HiRISE images.